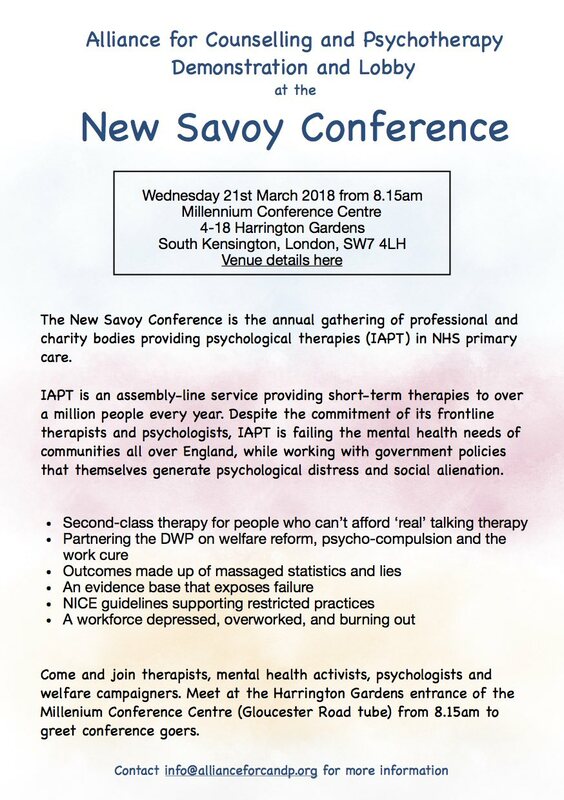 The Alliance for Counselling and Psychotherapy has organised a demo at the New Savoy conference again this year. Please circulate the flyer linked here to your networks and come along yourself if you can make it. It’s an early start at South Kensington. 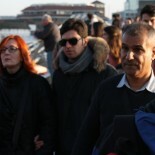 • The overall theme is depression; there are sessions on the crisis in the IAPT workforce, latest staff survey, impact of targets; session on Work and Health Unit; Wessely’s review of human rights and compulsory treatment; session on Employee Assistant Programmes (often run by people like Maximus); familiar faces in the list of speakers. • The scam of IAPT as a service in local communities. IAPT has a massive evidence base, tons of statistics for every CCG in England including “recovery” rates; ethnicity stats; deprivation stats; etc etc No-one really analyses the figures. For IAPT, it seems just collecting the stats is their claim to being evidence based and therefore their claim for funding from the Government. In fact, their stats reveal a shockingly failing provision. For example, out of over 1,350,000 referrals a year, 85% either never enter any kind of therapy, or never finish a course of treatment, or don’t “move to recovery” (as IAPT jargon has it). In my CCG (Tower Hamlets) only 6.6% of referrals to IAPT “recovered” and among the Bangladeshi community who make up over 30% on TH population only 3% “recovered”. Paul Farmer’s Taskforce target for % of population who “need IAPT therapy” is 15%, rising to 25% by 2021. In TH about 2% of the pop were referred/referred themselves to IAPT, of whom as I say 6.6% “recovered”. IAPT will be a major part of the propaganda around the NHS reorganisation now in progress, via the STPs and the ACOs they are developing (link here for more info on this). STP management have “the mental health crisis” high on their agenda – certainly their PR agenda – and selling more provision for IAPT services will be a major plank of the campaign. See Hunt on this role for IAPT here. IAPT is rarely taken to task as a service that is massively failing communities all over England. This is true in the Labour Party as much as anywhere else. This has to stop. It is a propaganda service for neoliberal capitalism and its dissemination of psychological scapegoating and coercion across society. This entry was posted on February 25, 2018 by paulwilliamatkinson in Uncategorized.